At this Wednesday's meeting, we had 16 members present. 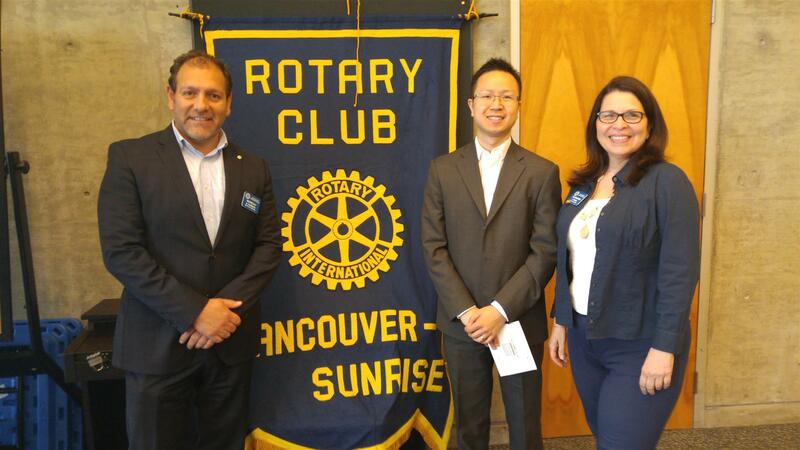 Our only guest was our speaker Bryan Yu who is the Deputy Chief Economist for Central 1 credit union. Sheila Anderson is doing the Rotary Moment this month. Today she read from Rotary Canada some of 20 things to know about Rotary. Among things he read were – 4 R.I. Presidents were from Canada, Winnipeg was the first club outside the U.S.A., and the R.I. Convention has been held in Canada 7 times and it is scheduled for Toronto next year. The Hoopathon is this Saturday. Please be there at 10 am and be ready to have fun! Our changeover brunch will be June 25th at Patron Tacos Cantina at 11 am. $35 per person. Meeting - Today our guest speaker was Bryan Yu, from Central 1 Credit Union. His presentation was titled "Economic and Housing Outlook for Canada". 2 more interest rate increases are expected in the US this year. The Canadian economy is expected to have modest growth in the second half of this year. The Bank of Canad is expected to hold rates for the rest of this year. The Canadian dollar is expected to remain in the 74-75 cents exchange rate. BC's outlook is positive, 2.8% growth expected this year. BC's labour market is the strongest in Canada.